The Best Startup blogs from thousands of top Startup blogs in our index using search and social metrics. Data will be refreshed once a week. Also check out Startup Podcasts and Startup Youtube Channels list for Top videos on Startup. 2.26 Startup Digest Blog - Curated news, resources, and stories from the global network. 2.38 OurCrowd - A better way to invest in startups. 2.75 //Startup News | Western Australian Startup News, Events and Opinions. 2.108 500 Hats - Geeks, Startups, & The Internet Revolution. Startup newsletter is a comprehensive summary of the day's most important blog posts and news articles from the best Startup websites on the web, and delivered to your email inbox each morning. To subscribe, simply provide us with your email address. Facebook fans 2,861,889. Twitter followers 10,022,101. About Blog 500 Startups is a leading global venture capital seed fund and startup accelerator. We manage $200M in assets and invest in 1,300 technology start-ups. Facebook fans 148,731. Twitter followers 519,851. About Blog Perspectives of a 2x entrepreneur turned VC at @UpfrontVC, the largest and most active early-stage fund in Southern California. Facebook fans n/a. Twitter followers 309,323. About Blog The place to discus startup problems and solutions. Facebook fans 1,040,209. Twitter followers 448,973. About Blog Fred Wilson, of Union Square Ventures, has been investing as a VC since 1986. His wealth of experience yields unique and useful posts on his blog AVC. Wilson posts every day, often with a compelling chart of infographic. Facebook fans n/a. Twitter followers 13,543. Vienna / Austria / Europe About Blog StartUs is the leading startup and innovation network connecting the European startup community. StartUs Insights is the intelligence and innovation unit providing organizations with actionable intelligence on innovation driven by startups and their technologies. Facebook fans 17,551. Twitter followers 53,909. San Francisco, CA About Blog I’ve written 650 essays which have been featured and quoted in The New York Times, Fortune, Wired, and WSJ. The topics range from mobile product design to fundraising to user growth. Facebook fans n/a. Twitter followers 111,198. About Blog Raise startup funding and gain critical insight to help launch your business through the startup accelerator and development program at Techstars. Facebook fans 65,677. Twitter followers 294,852. About Blog Selected ideas and assistance to entrepreneurs and startup founders in finding business ideas, funding, executive mentoring, and business networking to incorporate a business, file patents, add an advisory board, and address operational issues. Facebook fans n/a. Twitter followers 925,632. About Blog Steve is the co-inventor of the Lean Startup movement, a serial entrepreneur-turned-best selling author, and educator who has changed the way startups are built, how entrepreneurship is taught, and how big companies and the U.S. government innovate. Facebook fans n/a. Twitter followers 230,437. About Blog A blog by Neil Patel. Neil is the co-founder of Crazy Egg, Hello Bar and KISSmetrics. He helps companies like Amazon, NBC, GM, HP and Viacom grow their revenue. Facebook fans 618,000. Twitter followers 2,382. Brooklyn, NY About Blog Personal blog on startups, venture capital, entrepreneurship, etc. of Charlie O'Donnell of Brooklyn Bridge Ventures. Facebook fans n/a. Twitter followers 36,835. Boulder, CO About Blog I'm a VC at Foundry Group. I live in Boulder, Colorado, invest in software and Internet companies around the US, run marathons, and love to read. -Brad Feld. Facebook fans 877. Twitter followers 292,440. About Blog Forbes is a global media company, focusing on business, investing, technology, entrepreneurship, leadership, and lifestyle. Facebook fans 3,937,227. Twitter followers 11,281,859. About Blog For Entrepreneurs offers advice on the key issues founders and their teams face in getting started, getting funded, and building a successful company. Facebook fans n/a. Twitter followers 48,682. About Blog KillerStartups is a user-driven internet startups community. Entrepreneurs, investors, and bloggers are staying informed on up-and-coming internet startups using our blog platform, where internet entrepreneurs submit their startup to see what others think about it. Facebook fans 11,646. Twitter followers 14,353. San Francisco, Dublin, Chicago About Blog Interested in marketing, product management, customer support, design and startups? On our blog the Intercom team share thoughts, tips and lessons learned from five years of product building. Facebook fans 30,981. Twitter followers 35,735. About Blog In this blog, entrepreneurs chart their efforts to launch and build ed-tech companies and describe the challenges they face in securing funding, finding customers, and growing their businesses. Facebook fans 168. Twitter followers 6,278. Seattle, WA About Blog The Startup Finance Blog provides business leaders with everything you need to know about funding, growing and scaling your startup. Facebook fans 601. Twitter followers 14,108. About Blog Techworld is focused on digital disruption - the space where innovation and entrepreneurship meet enterprise IT. It offers the latest news and views on innovation, startups, disruptive technology and their impact on UK business and society. Facebook fans 14,016. Twitter followers 16,149. London, England About Blog Starting a business? Find independent advice, tools and information for new businesses, start-ups, small businesses and entrepreneurs. Facebook fans 6,762. Twitter followers 72,656. About Blog StartuS is an online platform where innovation meets talent: we help job-seekers to find amazing job opportunities easily manage job applications, startup enthusiasts to use a powerful search tool to find co-founders and like-minded people build and develop an entrepreneurial network. Facebook fans 15,611. Twitter followers 30,175. About Blog Technology news and startup data from the ANZ region. Facebook fans n/a. Twitter followers 19,832. About Blog Startupbootcamp is a global network of industry focused startup accelerators. Our startups have direct access to an international network of the most relevant mentors, partners, investors in their sector to help them scale globally. Facebook fans 36,103. Twitter followers 30,983. 26. Startup Digest Blog - Curated news, resources, and stories from the global network. About Blog Startup Digest is the personalized insider newsletter for all things startup in your community and around the world. Facebook fans 9,538. Twitter followers 85,647. About Blog NCrypted is a leading web development, website design and mobile apps development company. Our range of website clone scripts and platforms quickly enable you to launch your startup business venture. We assume full responsibility for your custom website design, website and mobile app development requirements. Facebook fans 2,669. Twitter followers 12,931. Facebook fans 9,509. Twitter followers 13,246. About Blog The top source for startup resources, business resources and startup business ideas for young entrepreneurs. Facebook fans 10,638. Twitter followers 82,130. About Blog Future Startup publishes articles and insight about the business, technology, and entrepreneurship in Bangladesh that you won’t find elsewhere. Facebook fans 18,533. Twitter followers 116. About Blog AlleyWatch is the largest organization for New York tech startups and tech community. Featuring NYC tech news, events, jobs, and critical insights. Facebook fans 3,848. Twitter followers 16,684. About Blog European startups, business angels, Web entrepreneurs and venture capitalists - welcome to the news feed. Facebook fans 20,341. Twitter followers 25,815. About Blog Come pitch your startup to the world. We are one of the oldest places for Startups to post their startups and apps. Simply fill out the questions to submit your own. Facebook fans 137. Twitter followers 2,629. New Delhi, India About Blog Feedough is one of the top grossing business websites in Asia. Ranked as one of the best startup and marketing websites, Feedough is the perfect place for marketers, entrepreneurs or any budding business enthusiast to learn and grow. Facebook fans 1,105. Twitter followers 158. Facebook fans 9,132. Twitter followers 2,966. About Blog Pixr8 is a global media platform dedicated to Startups and business organisations to promote business and financial activities in all over the world. Facebook fans 2,599. Twitter followers 1,551. About Blog Get collaborative & flexible coworking space. Shared office space for startups equipped with all the facilties; Workstations, High Speed Wifi, Meeting Rooms, Cafe & more. Facebook fans 45,264. Twitter followers 6,547. 38. OurCrowd - A better way to invest in startups. Jerusalem, Israel About Blog OurCrowd is the leading hybrid venture capital equity crowdfunding platform for accredited investors who wish to invest in Israeli and global early stage companies. Facebook fans 18,268. Twitter followers 9,360. About Blog RocketSpace is a technology campus helping tech entrepreneurs, startups and corporate innovation professionals bring the future to market. Facebook fans 4,075. Twitter followers 10,428. About Blog Small business ideas, business plans, & tips for African entrepreneurs to start, run, & grow successful businesses. Facebook fans 21,157. Twitter followers 360. San Francisco About Blog Jason Calacanis and a rotating group of guest experts bring you this weekly take on the best, worst, most outrageous and interesting stories from the world of entrepreneurship. Looking to start your own company? Need strategies for improving your business of motivating your team? Just want to catch up on what's happening in Silicon Valley and beyond then this is the place for you. Facebook fans 23,941. Twitter followers 26,262. About Blog Connecting the dots. Representing the startup community. Unlocking expertise & talent. Facebook fans 5,210. Twitter followers 11,323. Sunnyvale, CA About Blog MyDigitalStartup.net was founded in October 2016 with a simple mission: to be authoritative guide for digital Startups. We aim to publish unique, innovative articles and features of interest to our core audience entrepreneurs, startups, founders and anyone interested in digital technology trends. Facebook fans 129. Twitter followers 56. Israel About Blog The Online Startup is a blog for entrepreneurs and other players in the startup world. Written by Adv. Zachi Zach, a senior online lawyer, a mentor and an investor, this blog provides unique insights for entrepreneurs from both the legal and the business aspects of startup life. Facebook fans 4,841. Twitter followers 211. Australia About Blog Starteer helps entrepreneurs build great businesses. Starteer provides startups with great mentoring and advice to help you succeed. About Blog Get Business Plan Template. About Blog We mentor founders to take their startup to the next level. Set up, measure and improve metrics to get profitable or reach your next round of funding. Facebook fans 138. Twitter followers n/a. Mississippi, USA About Blog I’ll show you everything you need to know to get your product in the hands of consumers. Benefit from my years of experience & get the free checklist! Facebook fans n/a. Twitter followers 966. UK About Blog The International Startup & Founder Magazine. Facebook fans 4,136. Twitter followers 3,166. Barcelona, Spain About Blog Barcinno is the innovation hub for Barcelona's entrepreneurial and technology communities. As Barcelona's #1 English-language tech news source, Barcinno spotlights new developments, growing startups, and exciting events, while offering an unparalleled channel for the rapidly growing entrepreneurial community to expand their presence locally as well as internationally. Facebook fans 2,112. Twitter followers 7,513. About Blog Insights from running and growing a mid-sized tech company. Facebook fans n/a. Twitter followers 6,204. About Blog Startup-Buzz.com is an online platform for entrepreneurs, by entrepreneurs. It is driven by a motto to cover and deliver the latest news, updates and information about Startup World in a concise manner. Led by professionals, we own vision to create a collective library of Startup relative content through our website. Facebook fans 32,237. Twitter followers 532. Facebook fans 1,653. Twitter followers 12,517. About Blog The Startup Magazine aspires to educate and inspire startups. We provide advice, give access to business tools and tell great entrepreneur stories. Facebook fans 2,257. Twitter followers 13,081. New Delhi, India About Blog World's largest Startup Intelligence platform tracking 2,42,000 companies. Providing Smart Solutions to help grow your business. Mission to motivate and educate the world to make it a better place. Facebook fans 2,216. Twitter followers 309. About Blog Startup Canada is a national social enterprise supporting and giving a voice to entrepreneurs through online programs, national awards, flagship events, partnerships with private sector and government to foster a community for startup and small business success across the country. Facebook fans 9,276. Twitter followers 81,685. About Blog Get the latest news and information on entrepreneurship and start-ups, along with tips and tricks of starting your own business and learn. Facebook fans 38,324. Twitter followers 495. About Blog StartupJuncture.com is your source of insight in the Dutch startup scene.The latest news, backgrounds, research and inspiring guestblogs. Contribute! Facebook fans 2,827. Twitter followers 6,951. Tampa, FL About Blog The goal of Women Entrepreneurs Can is to help women overcome the unique obstacles we face as entrepreneurs and small business owners, while providing the knowledge you need to run a successful business. Not only will you find the reliable information to help your business succeed, you'll learn from experts who understand what it's like to be a woman in a business world that's dominated by men. Facebook fans 4,894. Twitter followers 22,480. About Blog A community of startups in Hong Kong promoting entrepreneurship and to grow Hong Kong as a tech-hub in Asia. Facebook fans 9,938. Twitter followers 25,065. About Blog Startup Lisboa supports the creation of companies and track their first years of activity. Founded in 2011 by the Lisbon Municipality, Bank Montepio and IAPMEI – Portuguese Agency for Competitiveness and Innovation IP, it's a private non-profitable association that provides entrepreneurs and companies office space as well as a support structure. Facebook fans 51,983. Twitter followers 6,678. About Blog Venture advisor, 4x entrepreneur, marketer & strategist. I live in Toronto, curate a lot, blog a bit, and help startups. A blog by William Mougayar. Facebook fans n/a. Twitter followers 2,053. Maryland, USA About Blog How to succeed in entrepreneurship; feat. founder stories, design articles, and startup deep dives that inspire your entrepreneurial journey. Facebook fans n/a. Twitter followers 1,574. Austin, TX About Blog Austin Startups is the voice of Austin tech startups and entrepreneurs. Find tech news, founder advice, and events. Facebook fans 201. Twitter followers 6,174. About Blog All about Startups, technology and inventions across globe. Facebook fans 8,405. Twitter followers 3,466. About Blog Silicon Canals is a platform for startups on the canals of Amsterdam - or those beyond in the Netherlands (sometimes even the Benelux). What does this entail? We write about the groundbreaking Dutch startups, the (thriving) startup ecosystem, venture capital funds, incubators and accelerators. Facebook fans 1,988. Twitter followers 3,255. About Blog We’re helping a new breed of entrepreneur to realise their dreams, startup founders that put people first and place happiness before profits. Facebook fans 3,875. Twitter followers 41,038. About Blog Live from the Rose City and the Silicon Forest, covering Portland, Oregon, technology startups, and bloggers. Facebook fans 2,957. Twitter followers 10,443. About Blog A place for startup founders, employees and investors to candidly share their stories, ask/answer questions and vent. Facebook fans 744. Twitter followers 2,368. About Blog Need help with your startup? Apply to StartupYard in Prague, the Central Europe Leading Accelerator for Technology Startups. Not your average incubator. Facebook fans 3,276. Twitter followers 3,030. Europe About Blog CoFounder is the only magazine for the European startup ecosystem. We serve our readers by introducing long-form, analytic storytelling to the world of startup journalism. Facebook fans 2,124. Twitter followers 11,196. About Blog Startup Edmonton connects entrepreneurs and product builders with community, skills and space to support them as they take an idea to reality. Since 2009, Startup Edmonton has created collisions - between developers, designers, makers, founders, investors and mentors - transforming ideas into companies. Facebook fans 3,746. Twitter followers 13,456. About Blog Building the San Diego startup ecosystem to foster an innovation economy. Facebook fans 1,334. Twitter followers 29. About Blog Startup Direct offers Start Up Loans and mentoring to launch or grow your business. Part of the Start Up Loan Scheme, Start up business loans for the UK. Facebook fans 3,041. Twitter followers 5,170. 75. //Startup News | Western Australian Startup News, Events and Opinions. About Blog Startup News publishes daily articles on news, opinions and interviews with Australian innovators and startups. Facebook fans 1,090. Twitter followers 3,799. About Blog This page features posts and information about different startups and startup service providers in Estonia (accelerators, co-working spaces, incubators, networks, training providers, etc) as well as best international reads on starting and managing a startup. Facebook fans 7,240. Twitter followers 2,126. New Delhi, India About Blog Get Startup Resources, News, List your Startup. Facebook fans 26. Twitter followers 52. About Blog Best resource for your startup. Facebook fans 1,485. Twitter followers 1,414. About Blog NZ Entrepreneur is New Zealand's free digital magazine for entrepreneurs and business owners, delivering insightful articles, interviews and business advice. Facebook fans 3,174. Twitter followers 3,196. England, United Kingdom About Blog Nova provide startup mentorship, investment and the team required to take you from idea to a successful tech startup. Catch up with Nova's news and our tips, tricks and advice for building and running your tech startup. Facebook fans 504. Twitter followers 1,641. About Blog Learn and engage on various business topics and lessons with the Partners at Red Rocket. This blog serves as an executive's strategic "playbook", with actionable "how-to" lessons on a wide range of topics, including business, strategy, sales, marketing, technology, operations, human resources, finance, fund raising and more. Facebook fans 138. Twitter followers 912. Ukraine About Blog Sloboda-studio is a Ruby on Rails Web Development Company. We offer web development services for startups, small and medium business. Facebook fans 285. Twitter followers 30. About Blog Gain access to entrepreneur resources, launch a company, or join the Startup Palm Beach incubator and grow an existing business. Facebook fans 2,250. Twitter followers 1,695. About Blog MyStartupLand is the world's most comprehensive source of reviews on accelerator programs, startup events and competitions. Facebook fans 712. Twitter followers 1,973. About Blog Sacramento startup & innovation community news & resources. Mission: connect the fabric of the Sacramento startup community. Facebook fans 169. Twitter followers 1,083. Chicago, IL About Blog AllStartups.org is Platform to discover and feature new startups across multiple categories from around the world. Our primary mission is to support, enable and encourage innovation by being the D.I.Y Media for entrepreneurs, companies everywhere. Our goal has always been to help the best entrepreneurs succeed in the world. Meet the Next Generation of Innovative Entrepreneurs, Founders, Ideas, Startups, Products and their Stories at AllStartups. Facebook fans 1,216. Twitter followers 1,736. Oxford Circus, London About Blog Low-cost virtual office services for start-up businesses or registered office addresses in London. Rent virtual business addresses and mailboxes. Facebook fans 26. Twitter followers 992. Cape Town, South Africa About Blog A Prestigeous Award for startups and startuppers. Facebook fans n/a. Twitter followers 2,348. About Blog Startupopinions is a leading blog platform profiling startups, reviewing new Internet products, and success stories of indian entrepreneurs. Facebook fans 4,955. Twitter followers 54. About Blog StartupHighway is a Baltic startup accelerator and an early seed stage fund based in Vilnius, Lithuania. Since it’s establishment in 2011 it has developed a proven investment programme focusing all of its efforts on value maximization for innovative technology startups. Facebook fans 4,394. Twitter followers 2,733. About Blog Blog for Puposeful Founders. This is a place for a huge amount of help, information & guidance on the tricky aspects of startups aiming to change the world. About Blog This is the blog of serial entrepreneur Phil Hayes-St Clair. He is also a husband, father and a former soldier. He writes something here every week to help others who are growing their business. About Blog Unicornomy is your Guide to Jungle of Unicorns (New and Old) in the current Economy, we analyze the best startups on their Revenue and Business Models. Facebook fans 264. Twitter followers 6. Tampa, FL About Blog Morgan Hill is a management consulting partner that helps startup to scale-up technology and tech-enabled clients innovate, build and grow. We deliver the right expertise and playbook, at the right time, for the right outcomes. We share our professional wisdom and market research on business strategy advisory, startup insights, management consulting, technology strategy, and investment trends. Facebook fans 10. Twitter followers 4,045. Northern California About Blog This is Hiten's blog. He's an entrepreneur who has started three SaaS companies. Facebook fans 48. Twitter followers 224,430. About Blog The Home of Melbourne Startups, Startup Resources, Online Business Ideas, and both local Australian and International Entrepreneurship. Facebook fans 1,101. Twitter followers 5,098. United Kingdom About Blog Start your journey to business success with Passport 2 Success. Take business courses to enhance your knowledge and get ahead of the competition. Facebook fans 14. Twitter followers 1,017. Facebook fans 3,560. Twitter followers 9,212. About Blog Finding the genetics of start ups and businesses in Canada. Facebook fans 1,411. Twitter followers 3,896. About Blog Got a great idea for a startup business? Startup Fredericton is a grass roots Startup Movement in Fredericton encouraging ideas - connecting like-minded people - to have explosive experiences! We gather people and their ideas; We explore those ideas; We connect people with people; We celebrate ideas - nothing is too crazy with Startup Fredericton! Facebook fans 606. Twitter followers 1,257. About Blog Startup Tasmania exists to promote and support startup businesses across the state. We're an intelligent, dedicated group determined to build a strong future through invention and innovation. Facebook fans 1,741. Twitter followers 3,245. About Blog Love-Startups aims to help entrepreneurs to stay motivated and keep persisting during their long startup journey - motivation for entrepreneurs. Facebook fans 299. Twitter followers 1,532. About Blog Startups, marketing, entrepreneurship, ideas, tips, and geeky stuff from Jason Cohen, founder of WP Engine and Smart Bear Software. Facebook fans n/a. Twitter followers 15,781. Recife, Brazil About Blog I share knowledge gained throughout life and themes that I find important in the entrepreneur's journey, especially for the Startup entrepreneur. Facebook fans n/a. Twitter followers 741. About Blog Blog and online community for startup entrepreneurs. Practical advice for startup entrepreneurs. Facebook fans 216,849. Twitter followers 290,153. About Blog An inside peek into the workplaces redefining entrepreneurship. Facebook fans 3,229. Twitter followers 2,508. 108. 500 Hats - Geeks, Startups, & The Internet Revolution. About Blog Geeks, Startups, & The Internet Revolution. Facebook fans n/a. Twitter followers 343,603. About Blog A non-profit national campaign by entrepreneurs for entrepreneurs to celebrate, inspire and accelerate enterprise in the UK. Run by @CFEntrepreneurs. Facebook fans 12,133. Twitter followers 106,808. About Blog Trying to change how startups are built. A blog by Eric Ries. Facebook fans 54,185. Twitter followers 35,999. About Blog Andreessen Horowitz backs bold entrepreneurs who move fast, think big, and are committed to building the next major franchises in technology. Founded by Marc Andreessen and Ben Horowitz, the firm provides entrepreneurs with access to expertise and insights in innovation, executive and technical talent, market intelligence, policy and regulatory affairs, business development, and marketing. Facebook fans n/a. Twitter followers 351,736. About - TechCrunch is a leading technology media property, dedicated to obsessively profiling startups, reviewing new Internet products, and breaking tech news. About - 500 Startups is a leading global venture capital seed fund and startup accelerator. We manage $200M in assets and invest in 1,300 technology start-ups. About - Startup Grind is a global startup community designed to educate, inspire, and connect entrepreneurs. About - Behind every successful woman is her story and that’s what She Owns It is all about. Empowering women to write their own success stories! gathering place to find the “spark” that helps turn your dream into a reality. So fire up, step up and start up! Find your inspiration, gather your motivation and let She Owns It HELP YOU write your own success story. About - Starting a business? Find independent advice, tools and information for new businesses, start-ups, small businesses and entrepreneurs. About - Techworld is focused on digital disruption - the space where innovation and entrepreneurship meet enterprise IT. It offers the latest news and views on innovation, startups, disruptive technology and their impact on UK business and society. About - Startup Direct offers Start Up Loans and mentoring to launch or grow your business. Part of the Start Up Loan Scheme, Start up business loans for the UK. About - The International Startup & Founder Magazine. About - Startup Canada is a national social enterprise supporting and giving a voice to entrepreneurs through online programs, national awards, flagship events, partnerships with private sector and government to foster a community for startup and small business success across the country. About - Startup Ottawa is a place for budding and seasoned entrepreneurs alike to gather, learn from each other and get access to invaluable resources, and programming. Our mission is to “Promote, Provide, & Connect” the startup businesses in Ottawa. We are entrepreneur-led and committed to the long-term success and sustainability of our community. About - We want to see more tech-enabled companies start and scale in Edmonton! Supporting entrepreneurs as they build and grow tech-enabled products & companies is at the heart of Startup Edmonton. About - Startup Peel is a place for budding and seasoned entrepreneurs alike to gather, learn from each other and get access to invaluable resources, and programming. We are entrepreneur-led and committed to the long-term success and sustainability of our community. Starting up is hard and we all succeed by working together. About - Startup creative is the place where risk-taking and creativity explode into action. A tool for entrepreneurs and future innovators, we equip goal-setters on their merry way to becoming colossal goal-getters. Startup News | Western Australian Startup News, Events and Opinions. About - Startup News publishes daily articles on news, opinions and interviews with Australian innovators and startups. About - SheStarts is Australia's only venture-backed startup program designed to help female entrepreneurs build big tech businesses. About - Our passion for entrepreneurship and its resounding global resonance is only matched by the zeal to bring our peers onto a single platform for a free-flowing exchange of ideas and visions. We work from all over India to bring the best and the brightest entrepreneurs into the limelight they deserve. About - Startup Opinions is a leading blog platform profiling startups, reviewing new Internet products, and success stories of indian entrepreneurs. About - The reason I started Trak.in was to keep myself, and in the process also the readers, in touch with latest Indian Business and Startup Buzz. The focus of this blog will always remain on Indian Business and startups in general. About - World's largest Startup Intelligence platform tracking 2,42,000 companies. Providing Smart Solutions to help grow your business. Mission to motivate and educate the world to make it a better place. 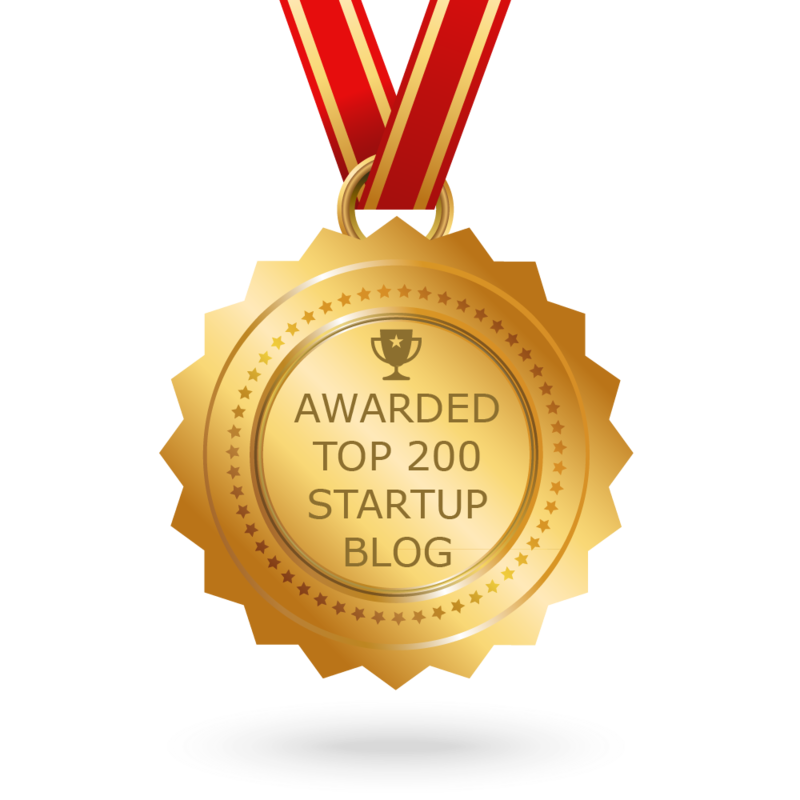 CONGRATULATIONS to every blogger that has made this Top Startup blogs list! This is the most comprehensive list of best Startup blogs on the internet and I’m honoured to have you as part of this! I personally give you a high-five and want to thank you for your contribution to this world.